Doing wheel alignment in Kent WA since 1965. We have the experience to do your wheel alignment correctly - on any vehicle - new, old, big or small. Wheel alignment service has been a major part of Warren Secord Automotive & Tire for over 50 years. We have specialized in Kent WA wheel alignment adjustment since day one and continue to invest in the latest high tech wheel alignment tools, equipment and training. And we keep up to date. Warren Secord Automotive & Tire has been doing computerized 4 wheel alignment in Kent WA since 1965. Vehicle technology has changed dramatically over the last 50+ years and we invest in the latest technology and training to provide you with accurate wheel alignment. With such an extensive alignment history we know how to do a wheel alignment right. At a competitive wheel alignment price in Kent WA. Our combination of the latest high tech equipment, the best ASE Certified Technicians, and 30+ years experience offers you unbeatable value and a wheel alignment done right - guaranteed! Warren Secord Automotive & Tire performs front end alignment in Kent, WA. Our cost of wheel alignment is very affordable and we often have front end alignment coupons or front end alignment specials. We perform all types of auto wheel alignment including four wheel alignment on import and domestic autos, car wheel alignment, SUV wheel alignment, light truck wheel alignment, van wheel alignment, 4x4 wheel alignment, all wheel drive wheel alignment, 4 wheel alignment. Warren Secord Automotive & Tire can solve your Kent, WA wheel alignment problem. *Alignment adjustment on some vehicles may require additional cost. Please contact us and we will be happy to provide a wheel alignment estimate for your vehicle. 1) How often should you get a wheel alignment? A wheel alignment measurement should be done once a year. Usually we recommend doing a wheel alignment in the spring after the risk of hitting a curb in the slippery snow covered roads and after the pot holes have been repaired! If you notice a change in how your vehicle steers or handles when traveling down the road you should get a wheel alignment inspection immediately. Normally wheel alignment gradually changes with normal wear and drivers don't notice the minor changes. If there is a sudden change in how your vehicle steers you may have a serious safety issue. The other reason to get a wheel alignment is when the tires are replaced. A wheel alignment problem can destroy new tires very quickly. Also, new tire guarantee requires a wheel alignment check. 2) Why does a wheel alignment cost more on some vehicles? Four wheel alignment takes more time than a two wheel alignment. Wheel alignment on some vehicles is just easier to perform. For example a 4WD vehicle wheel alignment is more complex and time consuming than a simple rear wheel drive vehicle. Some vehicles have previous crash damage that makes alignment difficult and often more complex. Some damaged vehicles will need additional special parts or modification to perform a correct wheel alignment. Rust damage causes a wheel alignment to take more time or even require heavily damaged parts to be replaced before a wheel alignment can be completed. 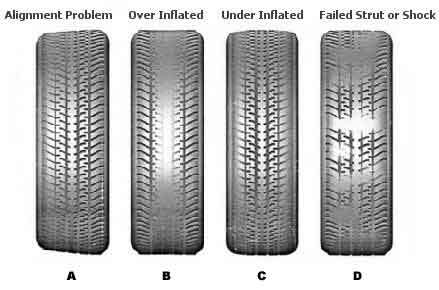 All these reasons can cause a different wheel alignment cost. Often a final wheel alignment price can not be quoted until the vehicle is inspected. A wheel alignment is a procedure to inspect, measure, and adjust all the steering and suspension parts that allow you to maneuver and control your vehicle. Warren Secord Automotive & Tire has the latest wheel alignment technology and skills to keep your vehicle rolling straight & true. Using lasers & wheel mounted sensors we are able to consistently perform very accurate wheel alignments.